Julius II, born Giuliano della Rovere, Roman Catholic Pope from the 1st of November 1503 to the 21st of February 1513, was born at Savona in 1443. He was at first intended for a commercial career, but later was sent by his uncle, subsequently Pope Sixtus IV, to be educated among the Franciscans, although he does not appear to have joined that order. He was loaded with favors during bis uncle's pontificate, being made bishop of Carpentras, bishop of Bologna, bishop of Vercelli, archbishop of Avignon, cardinal-priest of S. Pietro in Vincoli and of Sti. Dodici Apostoli, and cardinal-bishop of Sabina, of Frascati, and finally of Ostia and Velletri. In 1480 he was made legate to France, mainly to settle the question of the Burgundian inheritance, and acquitted himself with such ability during his two years' stay that he acquired an influence in the college of cardinals which became paramount during the pontificate of Pope Innocent VIII. A rivalry, however, growing up between him and Roderigo Borgia, he took refuge at Ostia after the latter's election as Pope Alexander VI, and in 1494 went to France, where he incited Charles VIII to undertake the conquest of Naples. He accompanied the young king on his campaign, and sought to convoke a council to inquire into the conduct of the pope with a view to his deposition, but was defeated in this through Alexander's machinations. During the remainder of that pontificate Della Rovere remained in France, nominally in support of the pope, for whom he negotiated the treaty of 1498 with Louis XII, but in reality bitterly hostile to him. On the death of Alexander (1503) he returned to Italy and supported the election of Pope Pius III, who was then suffering from an incurable malady, of which he died shortly afterwards. Della Rovere then won the support of Cesare Borgia and was unanimously elected pope. 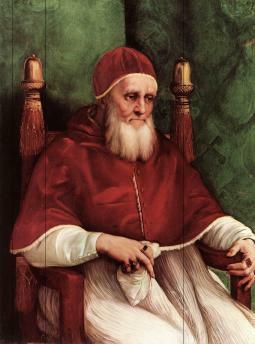 Julius II from the beginning repudiated the system of nepotism which had flourished under Sixtus IV, Innocent VIII, and Alexander VI, and set himself with courage and determination to restore, consolidate and extend the temporal possessions of the Church. By dexterous diplomacy he first succeeded (1504) in rendering it impossible for Cesare Borgia to remain in Italy. He then pacified Rome and the surrounding country by reconciling the powerful houses of Orsini and Colonna and by winning the other nobles to his own cause. In 1504 he arbitrated on the differences between France and Germany, and concluded an alliance with them in order to oust the Venetians from Faenza, Rimini and other towns which they occupied. The alliance at first resulted only in compelling the surrender of a few unimportant fortresses in the Romagna; but Julius freed Perugia and Bologna in the brilliant campaign of 1506. In 1508 he concluded against Venice the famous league of Cambray with the emperor Maximilian, Louis XII of France and Ferdinand of Aragon, and in the following year placed the city of Venice under an interdict. By the single battle of Agnadello the Italian dominion of Venice was practically lost; but as the allies were not satisfied with merely effecting his purposes, the pope entered into a combination with the Venetians against those who immediately before had been engaged in his behalf. He absolved the Venetians in the beginning of 1510, and shortly afterwards placed the ban on France. At a synod convened by Louis XII at Tours in September, the French bishops announced their withdrawal from the papal obedience and resolved, with Maximilian's cooperation, to seek the deposition of Julius. In November 1511 a council actually met at Pisa for this object, but its efforts were fruitless. Julius forthwith formed the Holy league with Ferdinand of Aragon and with Venice against France, in which both King Henry VIII and the emperor ultimately joined. The French were driven out of Italy in 1512 and papal authority was once more securely established in the states immediately around Rome. Julius had already issued, on the 18th of July 1511, the summons for a general council to deal with France, with the reform of the Church, and with a war against the Turks. This council, which is known as the Fifth Lateran, assembled on the 3rd of May 1512, condemned the celebrated pragmatic sanction of the French church, and was still in session when Julius died. In the midst of his combats, Julius never neglected his ecclesiastical duties. His bull of the 14th of January 1505 against simony in papal elections was reenacted by the Lateran council (February 16, 1513). He condemned duelling by bull of the 24th of February 1509. He effected some reforms in the monastic orders; urged the conversion of the sectaries in Bohemia; and sent missionaries to America, India, Abyssinia and the Congo. His government of the Papal States was excellent. Julius is deserving of particular honor for his patronage of art and literature. He did much to improve and beautify Rome; he laid the foundation-stone of St. Peter's (April 18, 1506); he founded the Vatican museum; and he was a friend and patron of Donato Bramante, Raphael and Michelangelo. While moderate in personal expenditure, Julius resorted to objectionable means of replenishing the papal treasury, which had been exhausted by Alexander VI, and of providing funds for his numerous enterprises; simony and traffic in indulgences were increasingly prevalent. Julius was undoubtedly in energy and genius one of the greatest popes since Innocent III, and it is a misfortune of the Church that his temporal policy eclipsed his spiritual office. Though not despising the Machiavellian arts of statecraft so universally practiced in his day, he was nevertheless by nature plain-spoken and sincere, and in his last years grew violent and crabbed. He died of a fever on the 21st of February 1513, and was succeeded by Pope Leo X.